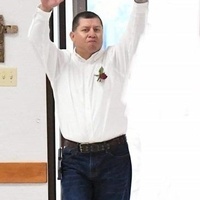 The town of Ballinger is mourning the loss of one of its most beloved city workers and all-around good person, Carlos Ruiz. At the young age of 37, Carlos passed away Thursday, April 4, 2019, at his residence. Born Juan Carlos Ruiz October 28, 1981, in Eden, Texas, to Oscar and Norma (Mata) Ruiz, he was known as Carlos. He graduated from Paint Rock High School in 2000 and began a beautiful family life with Sarananda Boone when they married August 13, 2005 in San Angelo. They eventually made their home in Ballinger, raising three happy children. A tireless and dedicated city employee, Carlos was superintendent of the city’s water department. A fellow worker said that no one could “operate a backhoe, fix a water leak, or make me laugh better than Carlos.” He was a loyal, appreciated member of the Ballinger Volunteer Fire Department. Most of all, Carlos was a man of faith and of family. Any time not on the job was poured into those two aspects of his life. He was a very active, devoted member of St. Mary Catholic Church, having served as a member of the church council and the Knights of Columbus council. He was named “Knight of the Year” for the Ballinger Council, and the entire family earned the title “Family of the Year” in 2017. In addition to spiritual training and “coaching” for Isabel, Juan and Jacob, he also coached Little League Baseball. He always supported and encouraged, not only his family, but also his church family, co-workers, and friends. A tribute to his strong faith, Carlos was gentle and caring, rarely getting angry or upset. His positive outlook and dynamic personality, plus his readiness to joke and laugh, made it a pleasure to work with him and know him. The community of Ballinger is richer because Carlos lived here. Surviving family who will grieve and miss his loving presence are his wife, Sarananda, and his children, Isabel, Juan, and Jacob, all of Ballinger; mother, Norma Ruiz of Paint Rock; brothers, Oscar Ruiz and wife, Toni, of San Angelo, and Rudy Ruiz of Paint Rock; brother-in-law, David Brem and wife, Blanca, of Ballinger; and nephews, Dominique Ruiz of San Angelo, Jett and Jr. Brem of Ballinger. Rosary will be recited at 7:00 pm on Monday, April 8, at St. Mary Catholic Church in Ballinger. Mass of Christian Burial will be celebrated on Tuesday, April 9, at 10:00 am at St. Mary Catholic Church. Burial will follow in the Latin American Cemetery.